The trick to living a long life may have been easier than expected. 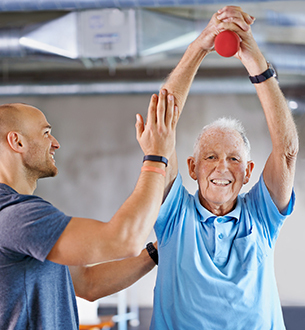 A study coming out of the University of California, Los Angeles (UCLA) has shown that older adults who possess more muscle mass tend to have a longer lifespan. Between 1988 and 1994, data was collected from over 3600 older individuals who participated in the National Health and Nutrition Examination Survey (NHANES). This included men 55 and over, and women 65 and over. Part of this survey involved conducting tests to determine the participant’s muscle mass index. The research conductors utilized a follow-up survey conducted in 2004, to see how many of the original participants remained alive and how many had passed from natural causes in hopes to find a connection between muscle mass and death. The results showed that the participants who had a higher muscle mass index when tested were more likely to still be living than those who had lower level of muscle mass. This shows increased validity that body composition as a whole is a better predictor of longevity than the previous method of focusing on body mass index (BMI). 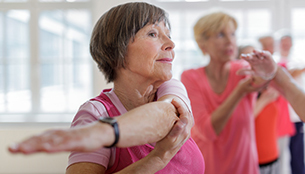 Often called aerobic exercises, these are great for helping make your day-to-day activities easier. Walking: Going for a walk, whether it’s around your neighborhood or a shopping center, is a good way to increase your heart rate. It also keeps your joints and muscles moving, preventing stiffness, and improving mobility. Yard and Housework: Gardening, mowing the lawn, raking leaves, or tidying the house all increase your breathing and heart rate, keeping your lungs and body healthy. Dancing: Not only is dancing fun, it also is a great work out that uses many of the muscles in your body. Swimming: Going for a swim is a low-impact exercise, meaning it’s easy on your joints but still requires a lot of endurance. Many pools have aerobic classes as well, which are quite fun. When you have a good sense of balance, your likelihood of experiencing a fall or a stumble decreases. Stand on One Foot: Being able to stand on one foot and remain balanced is an excellent skill to practice. Hold on to a chair or a table for added support until you are comfortable enough to do this on your own. Walk Heel-to-Toe: Walking in a straight line with your heel to your toe requires more concentration and balancing skills than you may think. It helps improve your overall abilities when you try and master this task. More flexibility increases your movement capabilities, and decreases muscle stiffness and shortening. Stretching: Every day, or whenever you are comfortable, try to stretch out your main muscle groups. This will help you limber up and reduce the risk of injury. Yoga: Participating in yoga activities will help increase your flexibility over time, and also calm your mind with the meditation portion of the class. Strength exercises improve your ability to carry out daily tasks, like lift pots in the kitchen, and climb stairs. Lifting Weights and Using Resistance Bands: Light weights and resistance activities improve muscle tone and increase muscle mass. Using Your Body: If you don’t have any equipment, you can look into exercises that use your body weight for training instead of traditional weights. Along with increasing muscle mass, exercising provides many other benefits for your body and overall well-being. If you or your loved one are considering making the transition from home care to independent or assisted living, give The Holiday Retirement a call at 860-233-8208 to learn more about the services and amenities we provide. Our retirement communities are located in Rhode Island and West Hartford, Connecticut. At The Holiday Retirement, we treat you like family. Fill out this online form if you would like to book a tour.